Although I'm very gung-ho on the series doing some original work, I'm a bit curious why we glazed over MM3 completely. @Steven Chase: Because maybe they want to surprise people by adding their own twists and turns as opposed to following the exact order of the games? I imagine the stuff in MM3 will appear eventually, just not now. (@Steven Chase) Who says we have? It's been known from the start that they want to alternate between game adaptations and original story arcs. After all, they didn't do MM2 immediately after MM1. This story arc is probably just setting up events for MM4, among other stuff. Given the next story arc is about Light and Cossack being at a robot convention this is probably just to foreshadow Mega Man 4, it won't actually BE Mega Man 4. So we'll probably get Mega Man 3 before hand, this is just to make it seem more of a big deal when Cossack goes "evil". It may still go in order, with this being a short side step. Issue 13 does start at a robotics convention, why wouldn't Cossack be there? Maybe Wily attends the show in secret, scouting out talent, and keeps the Cossack idea in his back pocket as a contingency plan, in case his Mega Man 3 plans fail. It makes sense Wily would start planning for failure after being beaten 3 times at this point (MM1, MM: Powered Up, MM2) and having no backup plans each time. We know he has planned for failure in the games (with the MM7 prison break). 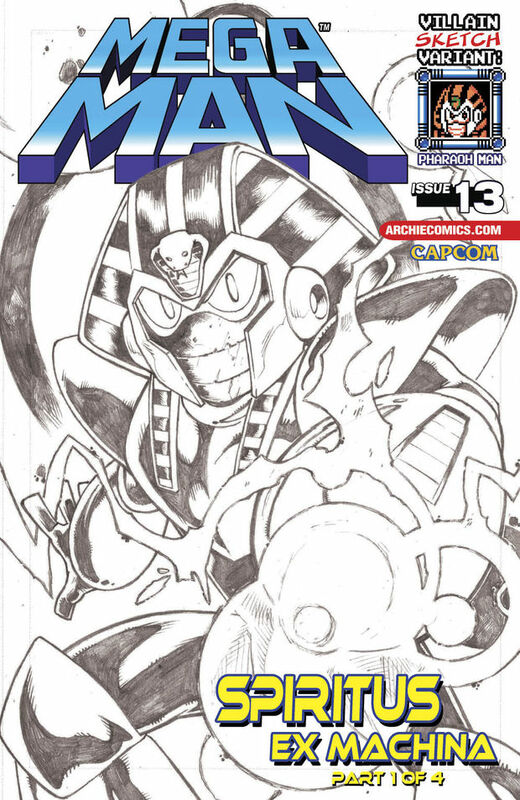 Considering it's a robot expo, Pharaoh Man may be Cossack's newest robot in the story that is in display. Ring, Dive, Dust and Skull are yet to be created. Mega Man: "Now I've got your power!" Don't get me wrong. I don't mind it at all... It was just unexpected. i love these comics but for the love of god guys don't order them directly from archie. I got mine today bent in half becasue they send them in plastic bags. They just tell me to email em, and they never emailed me back about the first issue i had with this, this is my second issue with teh same problem. I hate archie.